I’ve invested sometime into EMF-Databinding to add a new quite interesting feature i guess. Currently we have to problem that if your nested path crosses a multi-valued feature (=java.util.List) at some point the only solution today is to create a volatile transient feature which observes your EList and fire change events but this really clutters your Ecore-Model. I’d like to note that this feature is an experimental one and we don’t guarantee to break it e.g. by pushing it upstream to Eclipse Databinding but you are free to give it a try and report usefulness, problems, like, dislike, … . 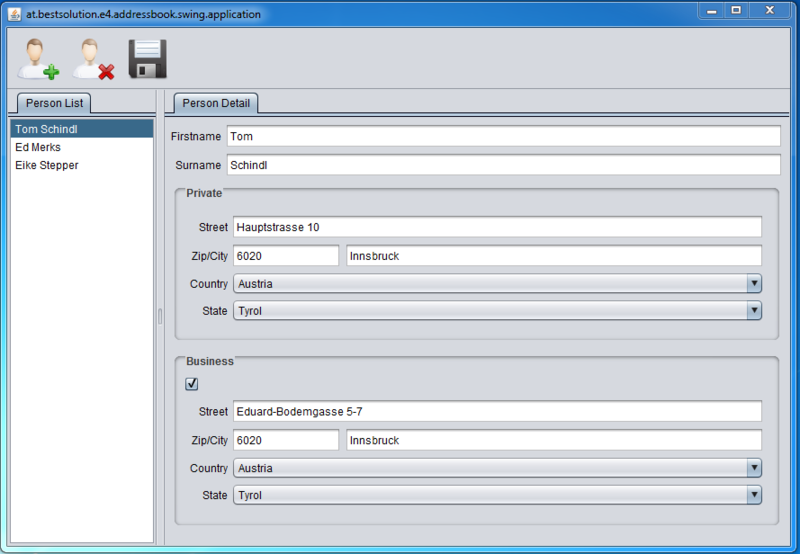 BTW did you notice that the screenshot from the above application was taken from a Swing-Application? How can that be? Isn’t Eclipse Databinding (and because of that EMF Databinding ) only useful within SWT driven apps (e.g. Eclipse RCP ones)? This entry was posted in EMF. Bookmark the permalink. I guess when you’re talking about “volatile” features you really mean “transient” features. I think it’s pretty important to make this distinction, especially to new EMF users, because typically presistence (resource) implementations do not check for volatile but for transient features. Thank you for your articles. 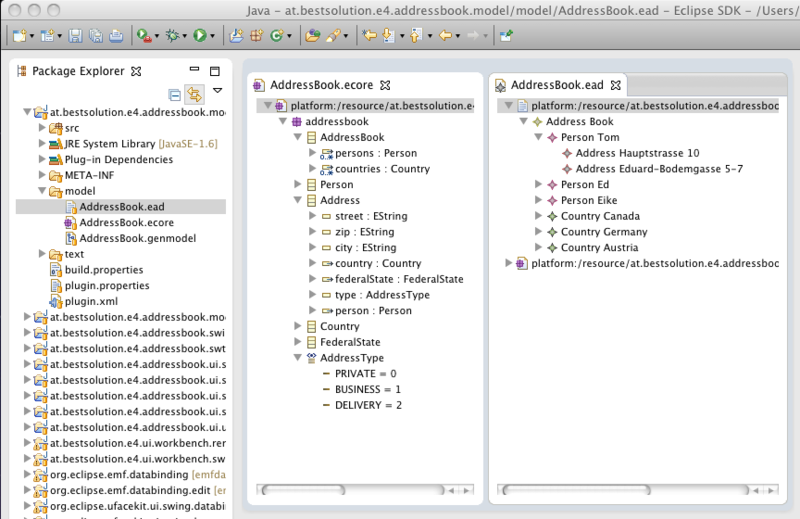 Is the address book project pictured above (or better a SWT/JFace version!!) available for download somewhere? Need search myself i’m quite sure i pushed it to a repo somewhere. Hy Tom, thanks for this blog entry! Could you possibly give a short info on the properties of the respective EReferences? That is, how does the EReference privateAddress select its resp. entry in the addresses list? I am currently facing such a problem with the usage of a Feature$Map and try to get the corresponding FeaturePath to work!